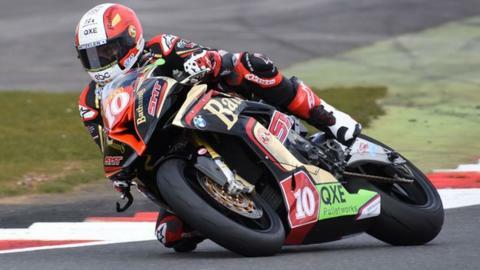 Michael Rutter has confirmed that he will attempt to add to his 13 North West 200 victories next month. The 43-year-old, in his 25th year of British Championship competition this year, will ride in the superbike, superstock and Supersport events. Rutter is also hoping to secure a supertwins ride at the meeting which takes place on 12 and 14 May. He will ride Bathams BMWs in the superbike and superstock races and a Gearlink Kawasaki supersport bike. Much of the attention in this year's event will be focused on Alastair Seeley's attempt to achieve a 16th victory which would make him the most successful rider in North West 200 victory. Seeley's three victories last year moved him level on 15 wins with the late Robert Dunlop. Rutter is currently just two wins behind Seeley but admits that he will face a tough task in adding to his North West triumphs. "I think it would be very difficult and it is a lottery going into that last lap at the North West," says the West Midlands man. "You could be leading going into Juniper Hill chicane and then end up third or fourth." Rutter's first Triangle course victory was in 1997 and his last a superstock triumph four years ago. However, a fifth-place superbike finish last year and a 131 mph lap in the senior race at the Isle of Man TT proved Rutter has lost none of his pace on the roads.